Hometown of Saint Francis who was born here in 1182 and died 42 years later after spreading the Christian message all over Umbria. The town’s quiet nature has not changed much since the saint’s times, besides the main holiday season when visitors are eager to visit this landmark of the Catholic Church. The town´s history begins in 1000 BC with the first Umbrian settlers who established themselves in this welcoming region. From then on many different rulers came to power: the Roman Empire, the Barbarians and then in the 13th century when Assisi became a free commune, the Ghibellines and the Guelphs, who supported the pope, struggled for power. It was in this battle which Saint Francis took part as a soldier. smaller towns go to Piazza Matteotti. La Fortezza is on Via della Fortezza near Piazza del Comune and serves typical Umbrian specialities and roasted meat. Its wine cellar listing local labels is very good. dishes which include rabbit, pigeon and homemade strangozzi. Its frescoed walls and beamed ceilings create a very pleasant atmosphere. Medio Evo as its name suggests, is situated in medieval vaults. It serves rabbit stew and truffle omelettes among many other delights and opens early in the evening. Buca di San Francesco is also housed in a building with medieval features. Its menu includes bruschetta, local sausage, gnocchi and home made desserts. You can be guided by its sommelier in choosing the best wine from their endless wine list. Grotta Antica offers a list of simple dishes and well priced wines, unbeatable in Assisi. Gran Caffè on Corso Mazzini sells delicious icecream and delectable sweet pastries and cakes. Its hot chocolate and iced cold tea are excellent for the appropriate season. BY BUS: to Perugia ( duration: 30 minutes, services: 9 a day), to Gubbio (duration:1.10 hours, services: 11 a day). Buses leave from Piazza Matteotti. There is an intercity bus station at Porta San Pietro from which buses to Florence leave (duration: 2 ½ hours, services: 1 a day). To Rome (duration: 3 ¼ hours, services: 3 a day). 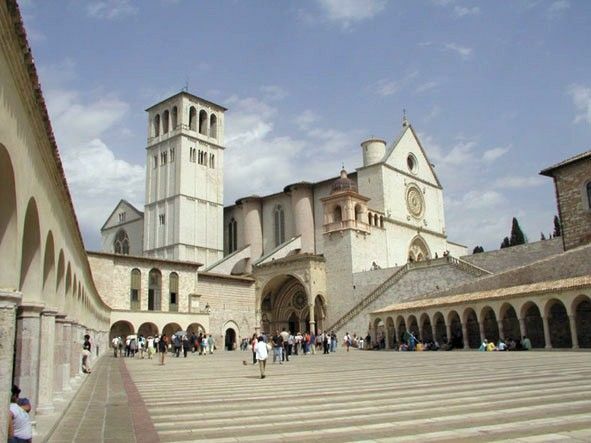 Within Assisi every 30 minutes there is a bus from Piazza Matteotti to the railway station. 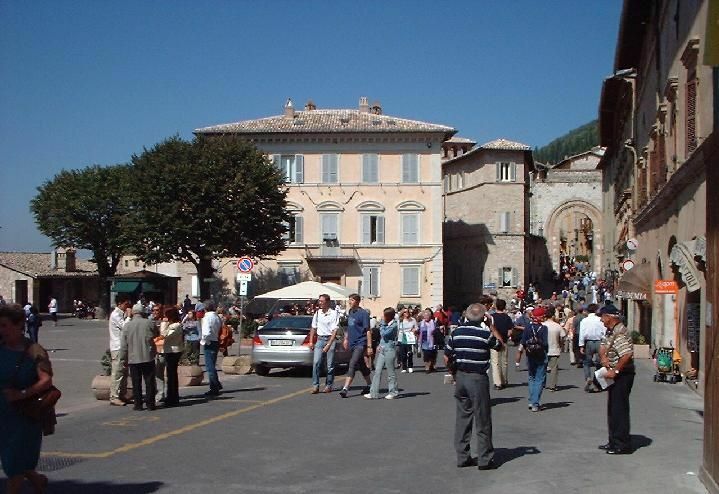 There are six car parks in Assisi all linked to the centre by orange buses. You can find free parking on Via della Rocca. BY CAR: from Perugia: drive along the SS75, take the exit at Ospedaliccio, then it is sign posted). BY TAXI: there is a taxi rank on Piazza Unità d’Italia. 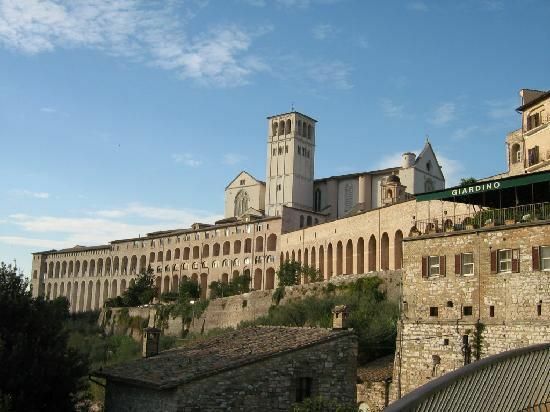 BY TRAIN: the railway station is 4 km away in Santa Maria degli Angeli; however, there is a bus connecting Santa Maria to Piazza Matteotti in Assisi. The line connecting Foligno-Terontola goes past Assisi. To Perugia (duration: 25 minutes, services: every hour). Those heading to Florence have to change at Terontola and those going to Rome at Foligno.